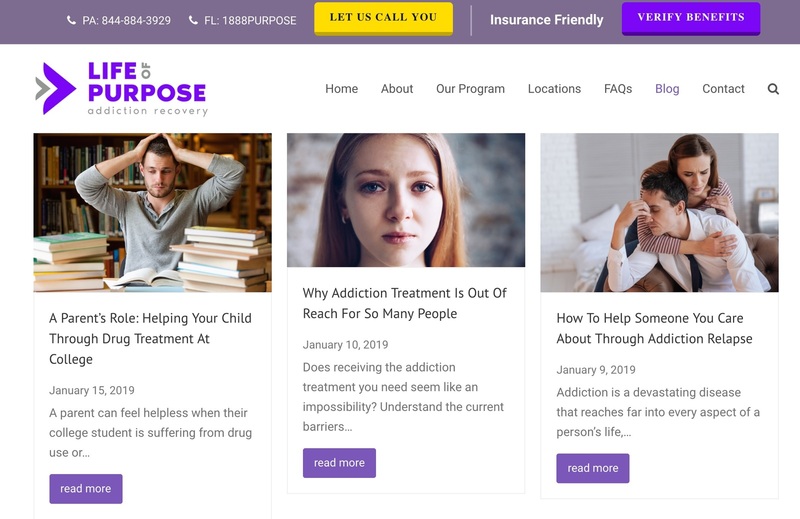 Philadelphia, PA / January 17, 2019 -- Life of Purpose, a provider of innovated addiction recovery services for adults and teens, has recently released two new articles to the blog on the Life of Purpose Website. The intent of these articles is to inform the community about some of the most significant challenges to seeking care and maintaining sobriety for the long term. Life of Purpose’s two new blog articles are titled "Why Addiction Treatment Is Out of Reach For So Many People,” and “How to Help Someone You Care About Through Addiction Relapse.” For those who are not living with an addiction or drug misuse disorder, it can be difficult to understand the challenges and obstacles to seeking effective treatment. Barriers to treatment can come from both external and internal sources and recognizing them is important for helping individuals living with an addiction get the treatment they need. “Why Addiction Treatment Is Out of Reach For So Many People,” addresses these barriers and helps to provide a new perspective on the challenges of seeking treatment. The second article, “How to Help Someone You Care About Through Addiction Relapse,” addresses the all too common issue of a reoccurrence of drug use or experiencing a setback during recovery, and how people who are closest to someone struggling with maintaining long-term sobriety can help the person they care about get back on the path to recovery. Life of Purpose is committed to helping people through every step of the recovery process. If you’re having trouble finding the treatment you need or you know someone who is struggling through a setback during recovery, they encourage you to contact them and to read their blog on the Life of Purpose website.